As part of our committment to continuous improvement, we working on a set of new standards, an alignment of our current farm standards, as well as several standard reviews and revisions. New ASC standards are being developed for Feed, Flatfish and Tropical Marine Finfish; and for an ‘aligned’ ASC Farm Standard based on the current farm standards. 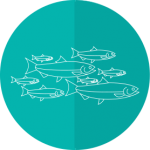 Reviews are also under way for the Shrimp, Freshwater trout and Pangasius standards, and for the Parasiticide treatment index (Appendix VII) and Smolt (Section 8), indicator 3.1.7 components of the Salmon standard.